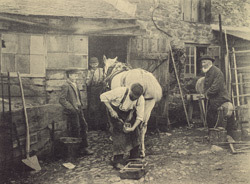 "'Shoeing the Grey Mare' (C. Smallridge, Ivybridge). Although the general effect of this picture is pleasing, yet it is not without serious faults. In the first place, the principal object, the farrier and the mare, is placed right in the centre of the picture, its weakest part; and man and mare and the second man in the doorway seem all mixed up together. The horse, too, is awkwardly posed: great animal painters like Landseer, Cooper, and others always took care never to paint the animal in the position shown. The old man in the corner rather tends to further weaken the compositin, and his room would be preferable to his company; and the motive of the picture does not suggest any reason for the broad grin depicted on the face of the youth on the left. The rest of the picture is admirable. Try again, Mr. Smallridge, and next time make success assured. An Optimus rapid rectilinear f/16, cap-off-and-on, was used to take the negative."